The garden is an integral part of the home, and a patio area, combined with the right awning, can add significantly to the living space by providing the ideal shaded area. Awnings used to be rather basic pieces of equipment which consisted of a canvas covering that could be opened or closed using a complex system of ropes and pulleys. Modern awnings, on the other hand, are discreet, stylish and very easy to adjust. With a wide range of colours and finishes, there is something to suit every environment. The ultimate in convenience, retractable awnings can be easily opened or closed, depending on whether you want sun or shade. We pride ourselves in the state-of-the-art mechanisms we use. These mechanisms are lateral style opening, and that means there are no unsightly vertical supports, which look clumsy and out of place. The full extension allows for a 45 degree opening, while the retracted awning fits into a cover, and is protected from the elements. For the fabric, we only use high quality acrylic imported from Spain, which is guaranteed for five years. Our fabric is in accordance with the ISO 9001 Certification. For larger awnings we recommend a motorised mechanism. In the event of a power cut, the awning can be retracted manually. There are occasions when the awning will not need be adjusted or closed, and a permanent fixing would be used, which keeps the awning steady all year round. Ideal for those areas where shade is required permanently, and with a range of patterns and colours, you can really change the ambience of the property. 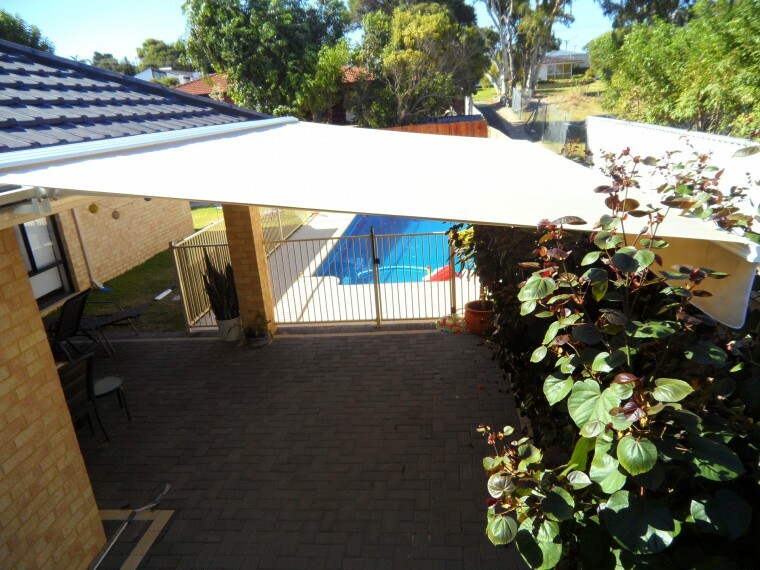 This Mediterranean trend is very popular in Western Australia, as we have the ideal climate, and the right awning can transform your patio area into a stylish alfresco dining space, perfect for those late breakfasts and the dinner parties in the long summer evenings. With a choice of retractable or fixed alfresco awnings, you can finally have a garden area that is shaded and protected. With additional screening, it is easy to create a windbreak. If your patio area is rather exposed, an awning with a roller screen either side, will give you a summer room that can be used for any purpose. Every home is unique, so our technicians will take accurate measurements, and your new awning will fit perfectly. The fabric we use is guaranteed for 5 years and all of our awnings come with a comprehensive 12-month warranty. Awnings must be installed correctly, and our seasoned teams work quickly and efficiently, leaving your home clean and tidy. We take pride in our reputation as a company that cares. The installation teams carry all the tools and materials so they can customise the awning on site. When the job is finished, one of the team will test the mechanism, and walk you through the process. Our many happy customers are a testimony to our concept of putting the client first. We strive to ensure 100% satisfaction every time. For more information contact us and start the process of transforming your property.